New York – Today, the Re-Clothe NY Coalition, a collaborative group of recyclers, non-profits, and governments working to increase textiles reuse and recycling across New York State, announced a renewed outreach campaign to encourage residents to donate and recycle their unwanted clothing and household textiles, rather than put them in the trash. This year's campaign dovetails with the adoption of landmark standards for coalition membership that establish common messaging and ensure transparency, data sharing, and the highest, best possible use of donated textiles. These standards, which were facilitated by the Product Stewardship Institute (PSI), serve as the basis for this year's outreach campaign and strengthen the Coalition, one of the first public-private partnerships of its kind and size in the U.S. Textile collection bins accept all household textiles – including clothing, shoes, towels, sheets, hats, pet clothes, and other items – as long as they are clean, dry, and odorless. Worn, torn, ripped, or stained items are accepted; even textiles that are no longer wearable can be donated for reuse and recycling. 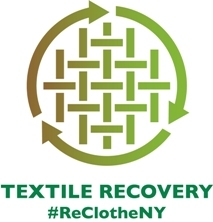 In 2014, NYSAR3, the Secondary Materials and Recycled Textiles Association, and the Council for Textile Recycling partnered to launch a statewide textile recovery campaign, eventually named "Re-Clothe NY," the most extensive effort at that time to increase textile recovery nationwide. The 2016 campaign builds on this success. This year, NYPSC and PSI created new and updated outreach materials to make it easy for local governments, organizations, associations, and community advocates to help the Re-Clothe NY Coalition spread the word about the benefits of textile recycling. The Outreach Toolkit and Media Toolkit include sample social media posts, fact sheets, posters, and media alerts, making promoting textile recycling as easy as copy-and-paste for New York agencies, organizations, and community advocates. Visit the Re-Clothe NY website for a list of acceptable materials, collection bin locations, the Outreach and Media Toolkits, and other information on textile recycling in New York. Sponsored by the New York State Department of Environmental Conservation, NYSP2I is led by the Golisano Institute for Sustainability at Rochester Institute of Technology (RIT), and is a partnership between RIT, Clarkson University, Rensselaer Polytechnic Institute and the State University of New York at Buffalo. NYSP2I’s statewide reach is supported by partnerships with the state’s 11 New York Manufacturing Extension Partnership partners. NYSP2I’s goal is to make the state more sustainable for workers, the public, the environment and the economy through pollution prevention. Pollution prevention is reducing or eliminating waste at the source by modifying production processes, promoting the use of non-toxic or less-toxic substances, implementing conservation techniques and reusing materials rather than putting them into the waste stream.